Intense colours - they remind me of a Laurie Lee book. For some reason, whenever I think of 'When I Walked Out One Midsummer Morning' or 'Cider With Rosie' the descriptions seem to pulse in my imagination with yellows, reds and greens. These photos were taken after a family visit to the most incredible bookshop (a converted barn full of old stock and dusty tomes - with a whole floor for fiction, and shelf upon shelf of photography). On return, my mum commented that the 'light outside was perfect'. Usually when this sort of statement is made, I madly hurry upstairs so something can quickly be chosen to wear before the sun deserts us again. Maybe my subconcious was still on some literary-related level when I put together this ensemble (silk? layers? pleats? My future self spends her life in clothes like these while drinking countless cups of coffee and having interesting conversations in bookshops). But perhaps I am just overanalysing things! The surprising continuity of warm weather over the last week has been quite shocking. I keep expecting it to disappear suddenly, leaving me stranded without the usual requisite cardigan somewhere in the middle of nowhere. However, the sun lived has lived up to its golden expectations, and I even managed to go swimming in a river last thursday. One thing I like about sunny days is the shedding of the layers that usually go under any outfit - abandoning tights and long sleeved tops is most satisfying. Instead I have been enjoying floating around in various silk items whilst alternating between sunbathing and revision. This particular vintage seventies dress was bought by my mum from ebay. She had it for all of three seconds before I managed to sneakily smuggle it into my already bulging wardrobe. If my clothes were people, they would have probably died of asphyxiation by now. Here I layered the silk shirt dress over a vintage pleated skirt from a market in Bristol, and a silk Monsoon vest. The belt is vintage, as is the bag in the first shot, and my grandma gave me the wooden bangles. These silver wedges were one of my first pairs of high heels, and I thought I had donated them to a charity shop ages ago. Nevertheless, my very clever mum thought they might be worth hanging on to - and she was right! I am smitten all over again. 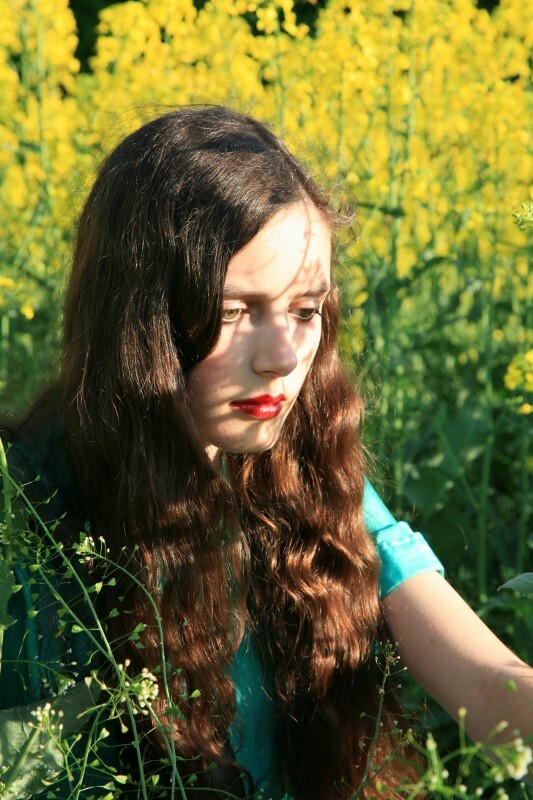 My dad took the photos in a field near our house. It is one of the default locations we plump for if we can't be bothered to make a special visit somewhere, and yet it constantly amazes me how many times one expanse of land can change in a year. The yellow of this particular crop is remarkably on trend (daahling! ), and also makes me think of vivid technicolour films such as 'The Wizard of Oz'. I had an article published by IFB today, on the subject of Blogging Against Adversity - with special emphasis on blogging through my scoliosis surgery and beyond. I was ecstatic to see the finished piece up on the website, and if you have the time I would really appreciate some feedback. Wow, your article is very inspiring! Blogging from the heart can be a challenge, but your example is certainly impressive and shows great courage. Love your outfit + article! Wow, such pretty photos. I really like the all the pics and the turqoise is a beautiful color on you. Beautiful photos, as always! I love the Technicolor-esq colors that pop out between the blue of your dress, the flowers, and your red lips. Reminds me of the colors in the Red Shoes! The article you wrote is wonderful. It very eloquently captures a hard time in your life and I commend your courage in sharing it. i love the layering of dresses, and your hair is fabulous! Everything about these photos is just fantasically beautiful; your hair, lipstick, dress, shoes. Not to mention the wonderful colours. Great post! I loved your IFB article Roz, it was very touching and powerfully written. You are an example to anyone out there blogging that you can share personal things and even though it's hard I am sure the rewards, whatever they may be, are worth it. Kudos to you for sharing! Additionally, I love the colors of your dress. The yellow flowers provide a perfect backdrop. I love the idea of layering these two pieces. Gorgeous setting. The colour of your dress is perfection and I like the idea of wearing it as an outer layer belted over the skirt & vest. I'm envious of your abundant sunshine, blue skies & blooming yellow flower fields! There has been plenty of rain here in Chicago and precious few flowers. This set of images remind me of old Kodachrome slides from the '50s and '60s. you are gorgeous not only on the outside and with fashion, but you also are on the inside! love your hair-it's perfect. and that dress is gorgeous! Your IFB article really touches the heart, it was a great piece. You look beautiful in that vintage dress from your mother, and the color of the jacket with the field background is gorgeous. I love the last photo. Your crouched position and facial expression is perfect! Plus, the angle of the shooting. AMAZING so nice and elegant and very direct and potent photography! You are not only very beautiful and stylish, but truly talanted in writing. 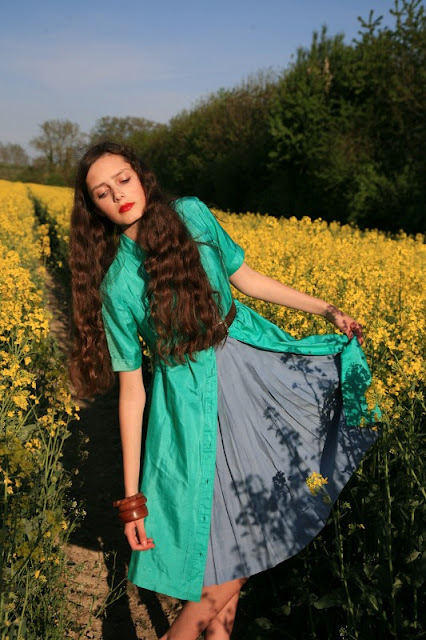 Love the turquoise shirt dress and the pics, full of spring spirit and freshness. Your article is even more impressive, respect! swimming in the river? oh my. beautiful writing and photography as always. thank you for brightening up my day. Love this the oversized shirt it works lovely! Roz, your post on ifb was truly heartwarming and you sum up exactly why we are all on here blogging away and sharing the things that matter to us with each other. I've left a proper comment on ifb and have re-tweeted your article. Turquoise and flower fields are two of my favourite things! The article for IFB was great. I love the scoliodress, and you delicately handled sharing the news with your followers. Your hair is so beautiful. I like the outfit, very pretty! Your photos are stunning. Found you on IFB. I absolutely found your post helpful and inspiring. Keep up the great work! these are such great photos. loved the article, the colors here are fantastic! He is very bom.Adorei photos, and your posts are really cool and interesting. And I found this very different and fun posting. Lovely! I love your blog, style and beauty!!! You're beautiful and all your outfits are just LOVELY! I've got one question - how tall are you? Please, reply - I just wanna [ have to :) ] know! i love that outfit, your style is amazing! such a wonderful and gorgeous photos!!!! I love the way you layered the shirt dress over the gorgeous skirt, the lengths are so perfect for eachother! Congratulations for getting your article published on IFB, thats amazing!! It's such a brilliant piece of writing and is written with such depth and meaning. Beautiful bold shots of color in an amazing spring backdrop! love the styling, right down to those amazing brown touches! YOu look stunning as always hun! Nice post and great pictures! shimmering colors- exquisite! it's pretty the way you "grounded" the blues with a neutral; i think this is the best way to wear colors.